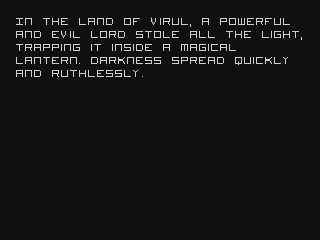 The land of Virul is in imminent peril, as a dark lord stole all of the light and sealed it within a magic lantern. Darkness spread over the world quickly and now it’s up to four heroes to save the day, except there’s a catch. Three of them are cowards and stay behind! In the end, all that matters is the answer to one question: can you get back the stolen light and save the world? 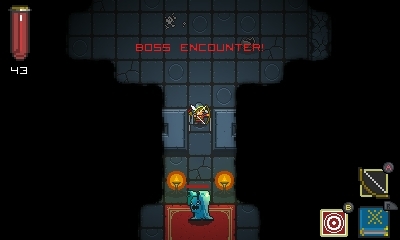 Quest of Dungeons is an indie, rogue-like dungeon crawler. It has retro 8-bit graphics and simple, randomly generated dungeon floors. You can play as one of a handful of characters: warrior, wizard, assassin, and shaman. There is also one more unlockable class in the game, as well as online leader-boards. In the leader-boards screen, you can check your own stats or look at the leader-boards. Your score is determined by how much loot you collect, and how fast you complete the game. Once you’ve selected your character, you get two intro scenes that tell you the basic story. As you can see, the story is very short and cliché. This isn’t a huge issue, as it doesn’t factor into the gameplay very much anyway. It simply sets your purpose, and tells you who you’ll face off with at the end of your adventure. If you have to stop playing, don’t worry. You can save mid-run and continue where you left off the next time you turn on your 3DS. 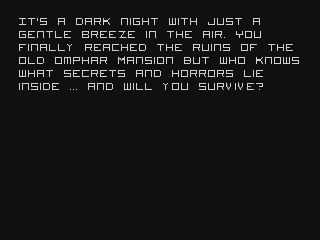 Next, a screen comes up showing some dialog between the four characters. The three cowards make you set out alone in this mildly humorous scene. After this, the mansion selection screen comes up. Initially you can only choose the first option, the Omphar mansion. The other two options are visible, but you just can’t select them until you’ve beaten the Omphar mansion. The second option is the Rackan mansion, which was added in a large update in the PC version of the game. This was well before the 3DS/Wii U versions came out. The third and final option is a custom game mode. In that mode, you can set the number of dungeon floors, difficulty (easy is not allowed in this mode), and floor size (60×60, 80×80, or 110×110). I find it odd that easy difficulty is not allowed in custom games. This is a bizarre design choice since there is not really any reason to not allow it. It’s an arbitrary limitation on what players can do, which is obviously not good. After selecting a mansion, you are greeted with a blurb of story text for the selected mansion. Then you get dropped into the dungeons to begin your adventure. Regardless of which choice you made on the mansion selection screen, every dungeon floor is randomly generated. This includes the positions of items and enemies. On a given floor you will generally face the same types of enemies, but in random places. The stronger enemies are random in their appearance, too. The controls are fairly basic, and there are three different control configurations you can choose from in the pause menu. The actions available to the player are pretty basic regardless. You can move around, attack, and use the currently equipped special skill. 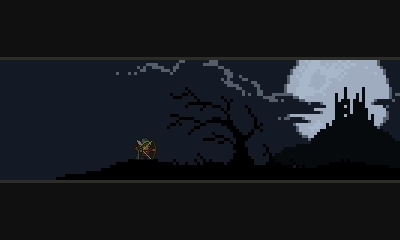 Combat is a pretty simple turn-based affair. Basic combat consists of simply running into the enemy repeatedly or hitting the attack button repeatedly. For ranged characters, you can attack from a distance with the attack button. The special skills also play a role in combat. 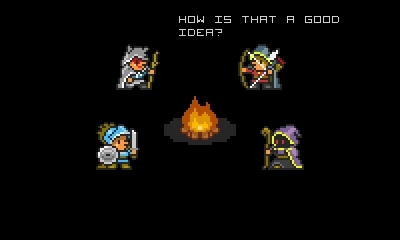 Each character in Quest of Dungeons starts with one special skill unique to them. Additional special skills are found in tomes in the dungeons. When you find one of these tomes, you can use it learn a random special skill permanently (until you die). You can change your equipped special skill at any time from the list of those you’ve learned. 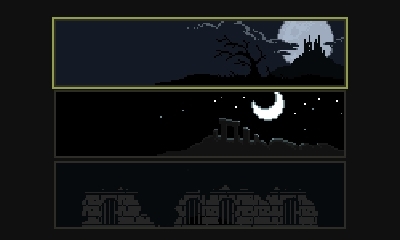 The screenshot above shows the starting room, which will look a little different each time you start a new game. You will notice that when you walk up to the skull sign, a Y button icon appears. If you press Y, you find out that it, bizarrely, kills you. This quickly shows you that Quest of Dungeons uses perma-death, so dying means starting the game over from the beginning. You probably expected that given the game’s rogue-like nature, though! 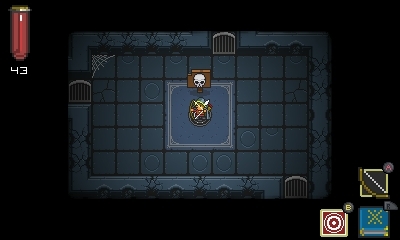 Throughout the dungeons, you will find breakable statues, desks, and bookshelves which can all drop items (as can enemies). Most of the time, you will also find a merchant somewhere on each floor. However, this is not always the case, as sometimes a floor will not have a merchant. You can buy and sell with the merchant, but you do have a limited number of inventory slots. This means you will have to make runs to the merchants to sell stuff when your inventory fills up. 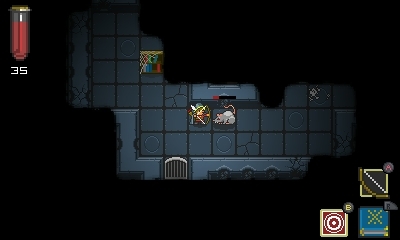 Sometimes you might run back to a previous floor if the current floor doesn’t have a merchant. Items include better versions of your character’s weapon, better armor of various types, potions, food, shields, and more. In addition to finding better equipment, you can also earn XP to level up your character’s stats. This only increases your stats, and the only way to learn new moves is from the special skill tomes. The previous image shows you the Quest of Dungeons map screen. 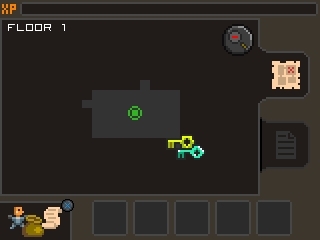 The lower left button opens the inventory (as does pressing X). The five empty slots to the right of that hold quest items. The lower tab on the right switches to a text display that shows a log of combat events and things. The magnifying glass button, of course, zooms the map. The green circle on the map is you. A key icon indicates that you need the displayed key type to open a locked door or chest at that location. Quests can be found occasionally on each dungeon floor from special stones with a colored circle on them. There are two types of quests; item search and powerful monster quests. An item search quest has an item spawn somewhere on the current floor for you to find. A powerful monster quest spawns a strong, named monster somewhere in the level for you to defeat. The quest description will give you a hint as to the location of the quest objective on the current floor. The quest monsters are much stronger than regular ones and can be very dangerous in later levels. Completing quests earns you a bunch of XP. You can also earn XP by killing regular and boss monsters. You also have to watch out for the boss monsters. They are very strong, but on later floors quest monsters can actually be much stronger than these guys. You don’t want to encounter either of these right away, even on easy mode. This is because even regular monsters take multiple hits to kill at the start of the game. You can heal with red potions, but your health also slowly regenerates as you walk around. Doors to unexplored rooms are closed, but open when you go through them. You can also close these doors again with the Y button to stop an enemy from chasing you further. This only works if the enemy is at least two spaces behind you. Otherwise, you can’t close the door since the enemy is blocking it. The gameplay in Quest of Dungeons can be fun, but it can quickly get repetitive. That’s par for the course with rogue-likes, though. The game also suffers from some balance issues. In the first mansion, you will likely want to avoid quests on the last floor. The quest monsters there are extremely over-powered. It’s not uncommon for them kill you in one hit, while boss monsters here are pushovers in comparison. This is worse when you unlock the second mansion. There, this problem sets in once you reach about the fourth floor. These one-hit kills are incredibly cheap and of course lead to annoyance and frustration. 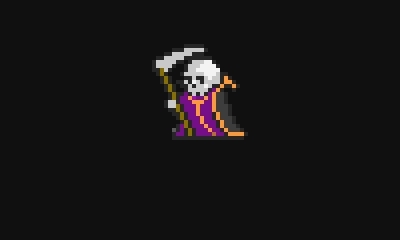 Additionally, the final boss at the end of the first mansion has a death spell, which kills you after a timer runs out. That can be pretty cheap, too, especially on the higher difficulty levels for sure. The graphics are nostalgic, but there aren’t that many different tile sets in the game. Some floors just use pallet-swapped versions of tile sets you’ve already seen. Some enemies are just pallet swaps too, but there are some entirely new enemies in the second mansion. The sound effects of Quest of Dungeons get the job done. The music is perhaps the best part of the game as it sets the mood well while being catchy. The array of items mentioned earlier makes it sound like the game has more depth than it really does. It’s a fairly bare-bones dungeon crawler that feels a bit rushed without the extra effort to make it really shine. The online manual you can access from the 3DS home menu is super short and largely useless. Quest of Dungeons is a good game to play in quick bursts. However, it falls far short of its potential since it does not really try to stand out from similar games. The gameplay’s heavily repetitive nature also hurts the game a bit, along with the balance issues. It’s fun for a good romp here and there, but not so much for extended play sessions. Beating the first mansion will take you a few hours to do, depending on how many times you die. The second mansion is similar, but will take longer due to its increased difficulty. The game is available on the 3DS eShop for $8.99, but you can also get it on Wii U, Steam, and Xbox One. 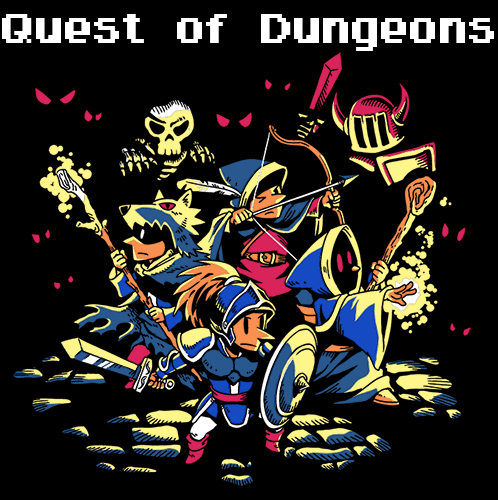 Quest of Dungeons is the game that asks if you can traverse countless random dungeon floors and hopefully live to tell the tale!